An irritatingly self-involved American takes a long and uneventful road trip to the Chilean seaside with some indulgent locals to get high on the boiled essence of an exotic cactus. That set-up may not bring the words "cinematic crowd-pleaser" to mind, especially when the group hooks up with a spacey 30-ish free spirit who calls herself Crystal Fairy, doesn't shave her pits and believes in magic pebbles. Also, the full title of this ultra-low-budget endeavor is "Crystal Fairy & The Magical Cactus and 2012," which has at least two too many aging hippie and psychedelic school bus overtones. Gaby Hoffman, who starred in Silva's 2012 "The Boring Life of Jacqueline," has been invited along for the ride in a moment of drunken insincerity by Jamie. Apparently oblivious to Jamie's later resentment and insults (he wants to ditch her at a bus stop, and refers to her as "Crystal Hairy" after seeing her full-frontal naked), she gives off an earth-mother vibe that's obviously hiding a more complicated soul. Where Jamie is rudely rational, Crystal dreads the upcoming end of the Mayan calendar because she worries "that this incarnation of humans is not going to realize its freedom." By contrast, Jamie's biggest fears are "madness, hopelessness and cops." When Crystal is out of hearing range, Jamie asks one of his fellow travelers whether he would prefer sticking his nose in Crystal's armpit for two hours or making out with his father for that long. None of this is played sit-com broadly, which has the effect of making Jamie and Crystal seem more like irritatingly amusing but believable human beings than stock odd-couple comedy characters. Jamie is so petulant and immature you may find yourself hoping he gets robbed or at least beat up a little when he brings a pair of streetwalkers home for a meal, but he's not wholly irredeemable. Crystal is "kind of exhausting" (Jamie's words) and placidly passive-aggressive, but she's hard to actively dislike. Who hasn't known people like that? "Crystal Fairy" allegedly was almost entirely improvised and shot in 12 days while director Silva was waiting for production to begin on another movie ("Magic Magic," also starring Cera). Expect a lot of handheld camera work, bad lighting and occasionally awkward ad libbing from the supporting cast, in other words. 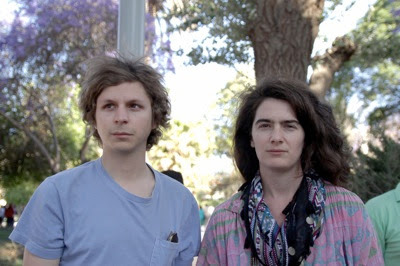 But Cera and Hoffman are appealingly offbeat naturals whose characters will stay with you considerably longer than a hallucinogenic cactus high.